Rancho Gordo, 1924 Yahome Street, Napa, CA. Beans never interested me very much — until a friend introduced me to the dried beans grown and sold online by Rancho Gordo, a small operation run by a bean enthusiast/possible nut, Steve Sando (pictured above). His beans taught me the value of fresh, recently dried beans. Before I tried a few of his varieties, I thought all beans were more or less alike, the differences between pinto, cannellini, and black notwithstanding. No. Some retain their firmness; some become milky soft; some taste nutty; some taste meaty. Who knew? I never realized. Now not only do I cook beans more often. 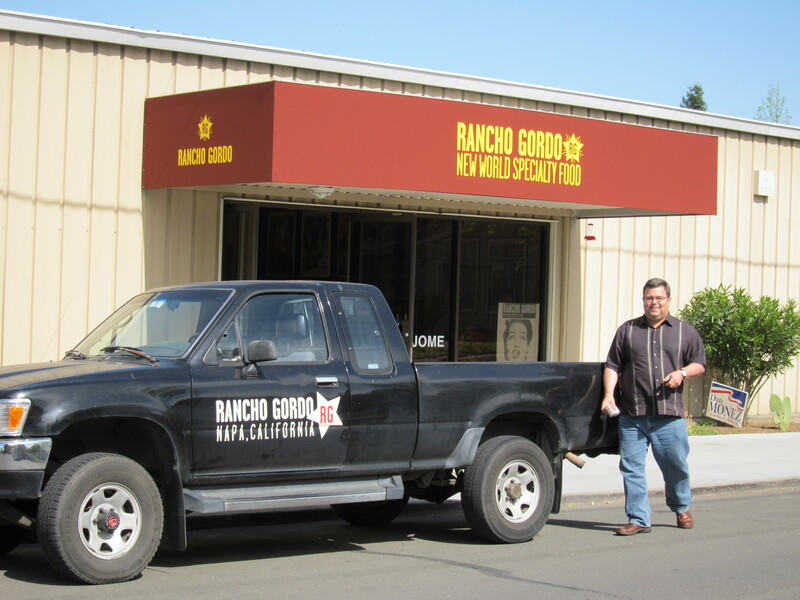 I only eat Rancho Gordo beans, which I order online. Once I knew how good they were, I ordered five or six 1-pound packages at the same time. It saves money. Rancho Gordo charges a flat delivery charge of $8, for which you receive your little box from FedEx in practically no time at all. If you’re lucky enough to live in the Bay Area, you can find Rancho Gordo beans at some farmers’ markets. Otherwise, you either order them online or visit the sparely-furnished Rancho Gordo storefront in the city of Napa. Inside the metal-sided shop, boxes filled with packages of beans are displayed on a few card tables right inside the door. The checkout stand is a tall bar, suggesting that the store had been a tasting room in a former life. Along one wall are shelves holding some clay bean pots from Chile, bottles of spices, t-shirts, cotton shopping bags, and cookbooks relevant to bean cookery. Chief among the cookbooks, Rancho Gordo’s own is indispensible. I’ve made a few of the recipes from a friend’s copy and have been very happy with the results. Now that I own my own copy, I’ll probably post one of his. In any case, many of the recipes, mostly Mexican, Italian or a fusion of the two, are already posted on the Rancho Gordo website. In the Rancho Gordo cookbook, Sando makes the claim that the more you eat beans, the less you’ll suffer from flatulence, because your digestive system will adjust. You know, I think he’s right, judging from my own very uncontrolled experiment on myself. Anyway, who cares? When I stopped in recently, I was lucky enough to meet Steve Sando, a genial guy, who had just that morning returned from a trip to Mexico, where he had worked in a tortilla factory for a week (“a nightmare”). He’s thinking of expanding his operation to include tortillas. I reacted to the news enthusiastically. I also complimented him on the very cool marketing graphics and colors. He blushed, placed his hand modestly on his collar bone and nodded thanks. “They’re my designs. It’s amazing what you can do with Photoshop.” I decided he was a mensch. Are you looking to support a small operation that practices sustainable agriculture? You could do worse than ordering beans from Rancho Gordo, although I should say that Sando worries about keeping up with the demand. No problems so far, but word is getting out. Already Food & Wine Magazine and the New York Times have drawn national attention to the business. So, if you want to taste real, honest beans, order now while supplies last. You forgot to mention the other great thing that Rancho Gordo offers: pre-soaked hominy for pozole. If, like me, you love making pozole but hate to use canned hominy and don’t really want to go to all the trouble of soaking the maiz in lime, then try Rancho Gordo’s product. I like, too, how Sando gives you useful tips on the website about how to prepare it. Oh, you are so right! I forgot about the hominy! Come to think of it, I didn’t see any in the store, but that doesn’t mean they don’t have any. Posole is the first thing we think about making, but it’s perfect for the Pork & Hominy stew in the yellow Gourmet Cookbook.